Brooklyn Decker misses flight to pump breast milk. 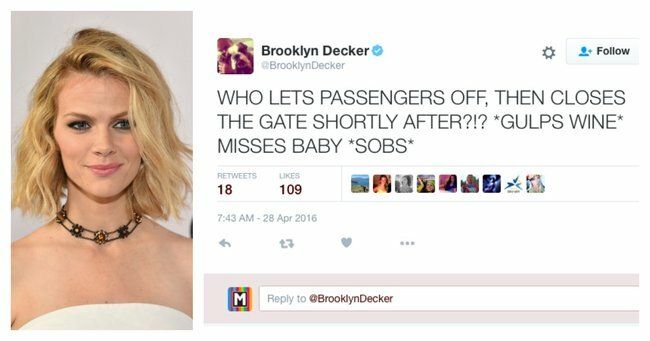 Brooklyn Decker's plane abandoned her because she had to pump breast milk. Brooklyn Decker has had a rough couple of days. The model and wife of former Tennis pro Andy Roddick had to leave her baby, Hank, for the first time on Thursday after she gave birth to him back in September. But what was meant to be a quick one-night stop over turned just a little bit messy after Decker missed her flight because she had ducked out to pump breast milk in the bathroom. The 29-year-old declared herself “livid” at the fact the airline had told passengers they were allowed to disembark the plane following a mechanical delay lasting over two hours. However, after leaving for what she believes was only 15 minutes, Decker claims the gates were closed and she missed the flight. First time leaving baby. It’s only 1 night & doesn’t make sense to fly him back & forth. I’m a mess. Moms: booze is my only solution,right? 2 mechanical delays. Told we could de-plane. I did. Pumped in the bathroom. Returned 15 min later. Flight closed. Deeeeep breaths. As women and as moms we try to do it all but it sure ain’t easy. What fun. We’re sure Decker will be more inclined to simply pump mid-flight from now on. On a lighter note, here are 10 ways breast milk can surprise your family and friends with Those Two Girls.